Have you ever had problems with smearing of print when die cutting in-line? If so, you may be experiencing die cut shock. The surface speed at the tip of a die cutting knife is slightly faster than that of the machine, so as the knife and anvil "grab" the board at the nip, the speed of the board passing through is also altered. This can cause the board to jerk while still in the last down which produces smearing of ink and also can throw the board out of register. 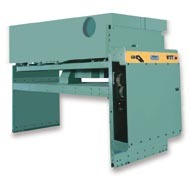 A CMI Vacuum Transfer (Dwell) Section separates the Die Cutter from the last print station, thus eliminating all die cut shock.It also provides time and distance before die cutting, two key components in the drying of ink. This machine also supplies you the space and ability to add a dryer head at a later date.